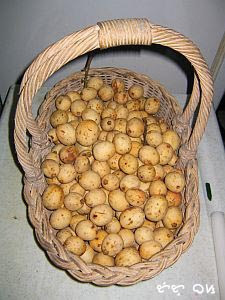 Known as langsat in Malaysia from where it originated, lanzones is a fruit that grows abundantly on the slopes of the Sierra Madre mountain range in Luzon, particularly Laguna province, in the volcanic island of Camiguin (that also have the Lanzones Festival) and various provinces of Mindanao. Lanzones trees are slender and has only a single trunk growing to about 10 to 20 meters tall (picture above). The fruit has an acidic taste and bitter seeds but the translucent flesh can be very sweet when ripe. In eating lanzones, it's always best to select the fruit already detached from the stem since it means it's ripe therefore sweeter than the ones left connected to the stem. Don't also bite the seed since it's very bitter. Big ones also mean lager seed; go for the medium sized fruit. Tutubi, in his childhood, got to to experience trekking up the slopes of Mt. 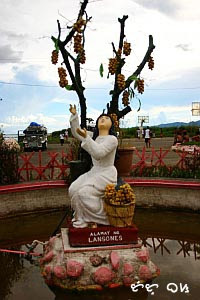 Humarap, the hill fronting Paete, Laguna, and part of Sierra Madre mountain to harvest lanzones. He still cherishes the thrill of actually going up and eating fallen lanzones fruits held by his shirt. Where can you find the sweetest lanzones there is? Tutubi doesn't have to be asked. He'll swear it's the variety found in his hometown. He's tasted samples from around Laguna, Sulu (currently sold in Metro Manila), and from Camiguin (but not the ones with less seeds in Bangkok, Thailand). In fact, a few years ago, people asked specifically for Paete's lanzones and not from Laguna due to the inexplicable succulence of the variety. It's just that the fruit is not commercially cultivated in Paete, reason why you can't find them in commercial quantities. Lanzones also spoil rapidly making it inappropriate for export to other countries. Even the legend of lanzones' magical change from a poisoned fruit to a sweet sensation is attributed to the artistic town of Laguna. thanks for the photo of the lanzones tree. sa totoo lang, i havent seen one! Yun pala, talagang may place kung saan nanggagaling ang matamis na lanzones..
Grabe mura ng lanzones ngayun ha, kanina bumili ako 40 pesos ang kilo! I love Lanzones, but I hate the sour ones. I also hate the big ones with the big seeds. It's the most bitter thing when you bit the lanzones seed, which makes me think na baka pwede gamot sa diabetes. Interesting facts about the Lanzones.When exactly is this Festival? I love lanzones too! I've seen people posting up photo of it and I thought it looked similar to langsat and now you confirmed that it's the same! I love lanzones, unfortunately we don't have them here. Well, they are sold at Filipinos stores, but they are frozen, and they are not as good as the fresh ones. My mom absolutely digs lanzones! With regards to the peelings, maybe they could be used as an alternative source of energy someday. There have been lots of developments with regards to such alternative fuels lately. 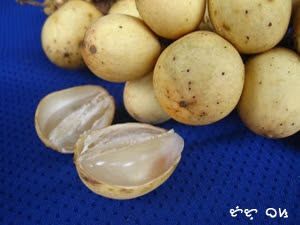 Lanzones season ba ngayon? Fave ko rin ang lansones, ang ganda ng pag present mo about lanzones dito ah. Hehe have yet to differentiate which lanzones is from. i have never seen a lanzones tree before too. masarap nga lanzones galing sa paete. tagal ko na nga lang di nakakakain. in season parin ba yun ngayon? I have had these before and they are sooooo good!! Great info too!! Thanks! I love the lanzones from Camiguin. Nakatikim narin ako ng galing sa Romblon and they are super sweet pero mas maliit nga lang. i was in Malaysia 10 years ago and eat lanzones - very tasty and of course for a Norwegian very exotic. Thanks for your visit and comment on my Chinese art post. I do agree learning about other cultures is good - thats why I do like your blog - thanks for sharing! Wow...thank you for teaching about this fruit, it's one I haven't seen before! I will put a link up to it, if you do not mind. Thanks for visiting me, I will be back soon! Ay, Tutubi! Taga Laguna ka nga pala. Pede, padalhan mo ako ng isang tiklis ng pinakamatamis na lanzones dito sa Dagupan? Will send you back a bucketful of Bonuan bangus in return. hehehe. really, paete lanzones are sweeter than those in mindanao? i have tasted lanzones from the different areas of the country: from davao, cotabato, misamis oriental, camiguin, laguna. the best still comes from camiguin. just like grapes used for red wine, not all harvests of lanzones are good. the good harvest of lanzones comes every other year or once very 2 years. the quality of lanzones is also easily affected by the change of weather. so if you have a crazy weather during the year, expect the harvest to be not so good in terms of volume and quality. right now, one notices that lanzones can be had all year round. it used to be that this is harvested in october or november with the peak season in november. but ever since our weather got crazy, there has been late harvest that is why sometimes you can find lanzones in february. there are other factors that contributed to this change of seasonality of the lanzones. you got me with the picture of lanzones--it is one of my absolute favorite fruits!! Pag maliit yung Lanzones, masarap at matamis, pag malaki di gaanong matamis..
what are the vitamins or minerals we can get from lanzones? does this fruit, lanzones, is really effective as an insect repellent and do they repel insects when insect smell the smoke?